The most remarkable thing about the Settha Palace Hotel is that it still exists. Built by the French in the 1930s, it was a mainstay of colonial Vientiane and in its heyday was managed by Frenchman Michel Theodas and his Chinese wife Yusin. Their tenure, and an era, ended in 1975 when the communists came to power, seized the property as worker housing and sent the Theodas family packing. Nearly 20 years later, with Laos reopened to tourists, Yusin, her son Billy  who in the interim had established his own Singapore-based hotel-management company  and grandson Jacques made a pilgrimage to see what had become of the grand dame. They found dank corridors and chickens pecking their way around the building. Bathrooms doubled as kitchens. There were cracks in the walls and holes in the roof. So began the next chapter. After lengthy negotiations, Billy Theodas secured a long-term lease and, in 1999, completed a vastly expensive restoration, footing much of the bill personally. 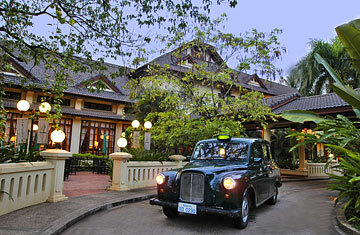 Today, the 29-room hotel again boasts French colonial styling, with four-poster beds and marble bathrooms. The formal dining room, La Belle Epoque, serves French cuisine and seasonal local fare. Having weathered nationalization and, since its reopening, not one but two recessions, the hotel has come full circle. Laos remains backpacker territory and not the sort of place where you can easily charge $220 and up for a room. But the Palace was bullish enough to embark on fresh refurbishments this summer. We're not sure what the secret of its survival is  but if anyone can work miracles in Vientiane, the Theodas family can. See www.setthapalace.com for more. Read "Next Time You're in ... Laos." See TIME's Global Adviser for exotic, beautiful and interesting getaways.